Humidity was almost 100 percent. Months of rain had the ground saturated. Clouds overhead hinted at more rain to come. The lawn needed maintenance and it could not be put off another day. My safety glasses fogged up as I edged and trimmed. Wiping off the glasses only cleared them for a few moments. My footsteps made a squishing sound because of the water soaked soil. Summer had been washed out by cool temperatures and abundant rainfall. Days later the sun came out. It was hot again. 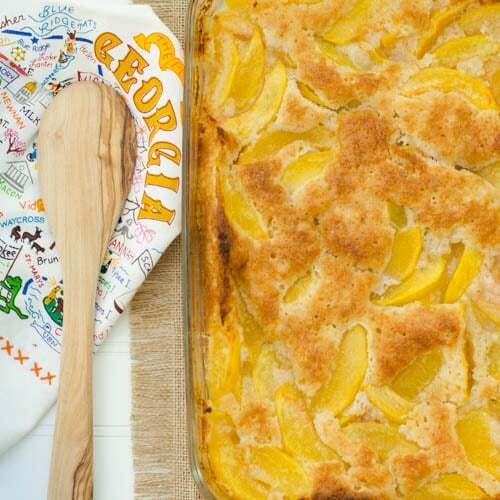 Celebrating the re-appearance of summer meant one thing: peach cobbler. Peach season has almost ended in Georgia. I could not find any at the local farmers market. A couple of weeks ago they were crates of them to be found. Now I see farmers are starting to harvest pears. It didn’t stop my desire for the peaches. My last resort was the grocery store. Luckily there was a bin and the peaches were marked from Georgia. They were not as soft and wonderful as those perfectly ripe ones at the market. However, they do fine in a cobbler. Baking and sugar brings out the flavor and sweetness. 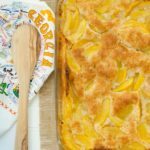 Peach cobbler has many variations. Those variations have more to do with the batter/dough/pastry. Some are made with a biscuit type dough. I’ve seen ones called cobbler that are really a big pie because of using pastry dough. This recipe is one with a batter. It’s poured in a pan over melted butter. Slightly cooked fresh peaches are poured on top and then it baked until golden. There is a hint of cinnamon and nutmeg which makes the peach flavor shine. What fruit means summer to you? Do you try to cook or bake with it as much as you can? I sure do. It started this year with peaches and cream frozen yogurt. Then came peach spice bundt cake. Now it’s peach cobbler to end the season. Next up is pears so stay tuned to see what I’m sharing with them. 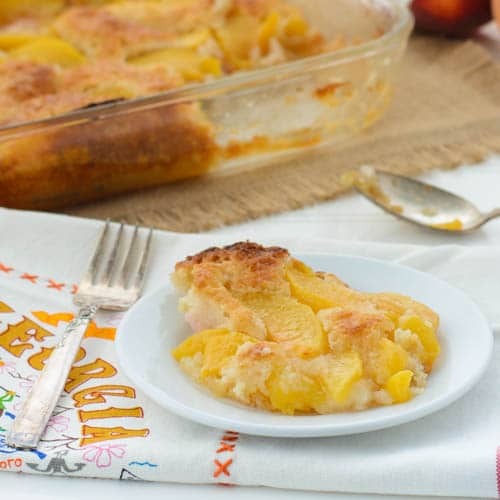 A recipe for peach cobbler made with fresh peaches. It is lightly spiced with cinnamon and nutmeg. Serve it warm or at room temperature plain or with ice cream. Combine peach slices, lemon juice, and 1 cup sugar in a medium saucepan. Bring to a boil over medium-high heat, stirring constantly. Continue to cook for 2 minutes, or until most of the sugar has dissolved. Remove pan from the heat. Whisk together flour, remaining 1 cup sugar, baking powder, cinnamon, nutmeg, and salt in a medium bowl. Add milk and stir just until dry ingredients are moistened. Pour peaches over batter. Do not stir. Bake for 40 to 45 minutes or until golden brown. Serve warm or at room temperature. Recipe adapted from one on the My Recipes website. I also enjoy the different varieties of cobbler. I should make it more often and with different fruits and styles. The weather has been down right crazy here. I think peach cobbler would make it better. Your version looks wonderful. It has been the strangest year for weather. We have more rain so far this year than we have in a typical full year. And yes, peach cobbler does make it all better! Very nice and thank you so much for giving it to me. I’ve been wanting to use it for a long time and finally had the right opportunity. I hope the sun reappears in Vancouver like it did for you! We had an unprecedented 40 days of sunshine and this past week it’s just been miserable, dark and rainy. It feels like fall already! Watermelon, peaches and cherries always make me think of summer. I’ve been eating as much as I can. I haven’t baked at all with summer fruit but I finally made a peach pie this weekend. This cobbler looks amazing, Renee! I’ve never had one made with cake batter and now I can’t wait to try it. I’d better buy more peaches before they’re all gone. We usually have 40 days of sunshine and yet we have been more like Vancouver lately. So much rain. I’m glad to see it has stopped for a while. I really missed all the sunshine this summer. 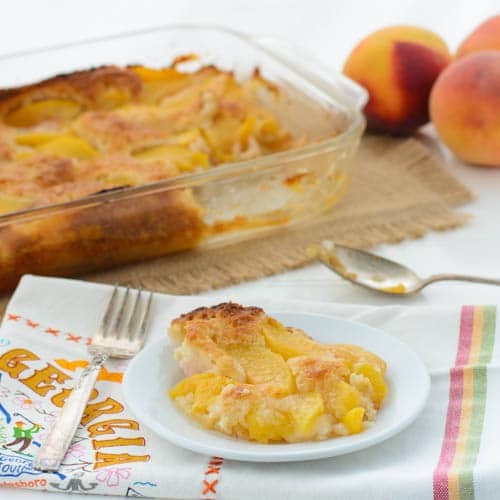 This is my favorite way to make a peach cobbler Hey I like the towel too ~ where did you find it? The towel was a gift from my dear friend Terry. She found it in Savannah, GA.
I’ve been dreaming of peach cobbler all summer, Renee. This version looks SO good. I like that it’s so easy as well. Definitely gonna try this. Great post! Better hurry up and bake one before all the good peaches are gone. Fresh peaches definitely need to be taken advantage on. They are amazing in most desserts, especially ones like this cobbler! I made one with pastry on top once, which was more a pie, like you said. It’s perfect for not-so-perfect fruit. So true how baking can make the most of not-so-perfect fruit. It’s a great way to use all the extra too. Oh, I want this transported to my kitchen! We can still get some lovely Michigan peaches, but I need to grab some before they’re done for the season. The high humidity is awful. Some people don’t understand how that can make the heat even worse. Not to mention constant bad hair days. What a gorgeous summer cobbler! I wish I had a piece (or 2!) right now. Thank you so much! If I could send you a piece or two right now I would. As much as I love peaches, they’re just not the same here in Michigan. To me, summer means CHERRIES. Lots of them, all the time, as many as I can eat. I love peach cobbler! But I always make a crumbly oat and brown sugar crust. Peaches are my favorite! A crumbly oat and brown sugar crust sounds good to me too. I need to make one of those too. Delicious! Had some beautiful peaches from Oyama, BC that I used and loved the recipe. I am going to play with the sugar as I found it a bit sweet … but no one complained! So glad to hear you loved the recipe. It is sweet for sure. I thought about using some brown sugar and may play around with it next time.